This past Monday, I loaded Jackson into the car and we headed off to Edinburgh to hike up a volcano. Did you know there's a 350 million year old dormant volcano in the center of Edinburgh? Much of it was ground down by passing glaciers, leaving a few hills jutting up from the urban streets. The peak of the tallest hill, at 822 feet, is "Arthur's Seat." It's a nice hike. Not a great one. The main draw is not so much the scrubby and grassy vegetation, but rather the views the hills provide of the city and the Firth of Forth. That said, birdwatchers are drawn to the waterfowl nesting around several small lochs in the hills. Geologists enjoy the Salisbury Crags, a line of basalt and dolerite cliffs. James Hutton, the 18th century "father of modern geology," was captivated by the differing igneous and sedimentary layers of stone, which helped spur his ideas about the long processes of rock formation and deep time. Dog walkers are specifically "welcome" to bring their "well behaved" dogs. Most hikers start from trails beginning near a parking lot adjacent to Holyrood Palace. The main trail leading to Arthur's Seat starts gently. Very soon you come upon the remnants of a 15th century chapel. The back of Holyrood Palace, which serves as the Queen's official residence in Scotland. In a valley looking up at Arthur's Seat. St. Anthony's Chapel may have been under the control of the Abbey of Holyrood (just a few hundred yards away), but more likely was controlled by the more distant, but also more powerful, Kelso Abbey. The chapel's tower once rose to 39 feet. Only fragments of the north and west walls remain. The trail then curves up along a ridge line, slightly steeper than before but still not too taxing. The gravel path has eroded slightly but the footing is easy, with stairs to make the ascent even simpler. Many other trails crisscross the main trail; you can detour or ramble as you please and never be lost. The hills and lochs make up a 650 acre royal park -- Holyrood Park -- first created in 1541. While it once was a game refuge for the king, it is now very well used by the public. Even on a midwinter Monday, there were hundreds of other hikers ambling over the hills. This is not a hike you take for quiet and seclusion. At this point, Jackson wanted to get out of his backpack and hike. Of course, that slowed our progress considerably. But he's a willing 2.5 year old climber, and I reminded myself that one of the reasons for taking him along on hikes is so he learns to enjoy hiking, not just riding. So we meandered, stomped, jumped, giggled, and sidestepped up the ridge. Jackson proudly hiked up this section, following the curve to the left beyond the frame of this picture. Good effort from a toddler. Arthur's Seat doesn't look especially steep until you get up close. I took this photo from the opposite side of the ridge from the main trail, as part of our preliminary explorations. Looking back down the trail, about 2/3 of the way from the top. The northern half of Edinburgh stretches all the way to the Firth of Forth. At this point, Jackson decided he did not want to complete our hike. Although he emphatically answered "NO!" to my questions asking him whether he was hungry, or thirsty, or cold, or tired of the wind blowing in his face, I think a combination of all those factors upset him. He of course refused any of my offers to help, and broke into tears. After a little while he calmed down, and we headed up. But every few minutes he would again start snuffling or crying, and we would pause as I tried to mollify him. Of course, it's the last bit of the hike that rises steeply, with somewhat uneven footing. Most folks can probably reach the summit of Arthur's Seat within 30 to 45 minutes. It took us more than an hour, given our slow progress from Jackson's hike up the hill and then his bouts of tears. But we eventually made our way to the top and gazed out on the city below. The view during one of our mollifying stops. Edinburgh Castle rises on the left in the middleground atop the other hill that juts sharply above the city. The summit of Arthur's Seat. Jackson calmed down at the summit, providing a minute of peace to let me snap a few pictures. View of Edinburgh from the summit of Arthur's Seat. If you want a shorter, but somewhat steeper, hike to the peak, you can follow the road around Holyrood Park and start your ascent from a parking lot on the eastern side. I've read that you can reach the summit in 20 minutes or so, but you'll have to put forth some exertion. View down the shorter hike from little Dunsapie Loch. Why is it called "Arthur's Seat"? The popular mythology claims the hills are a possible location of Camelot. 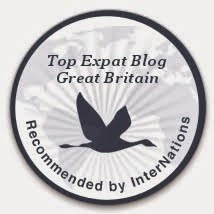 But there are several other places in Great Britain with a same or similar name (though none are especially convincing). And while there are traces of some early forts, there's no sign of a castle or anything like a significant settlement. 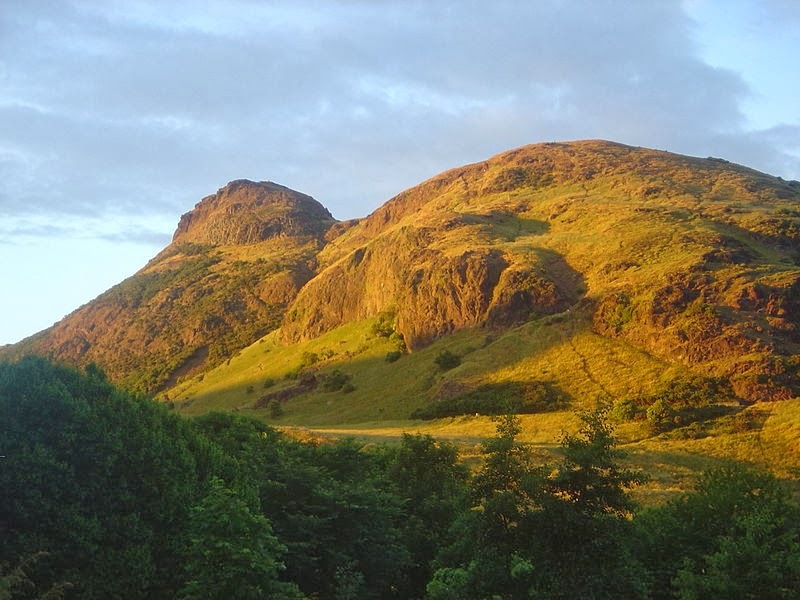 Others theorize the name "Arthur's Seat" is a bastardization of Scottish Gaelic phrases, but there's no real evidence for those claims, either. Simply put, no one knows the origin of the name. Given my druthers, I would've descended from the peak on different trails than we ascended. Robert Louis Stevenson described Arthur's Seat as "a hill for magnitude, a mountain in virtue of its bold design," and I would have liked to explore more. But the wee one's demands of a quick exit dashed those hopes. Fortunately, I'm sure we'll have opportunities later this year to make another foray, probably with dog and picnic in hand.